We first met Joe Sloan of Keepsake Imports at the Pigeon Forge Log Home Show. He’s based out of Ohio, but he also lives in Thailand 8 months of the year. That’s where he gets all of the materials to build his one-of-a-kind modern log furniture. 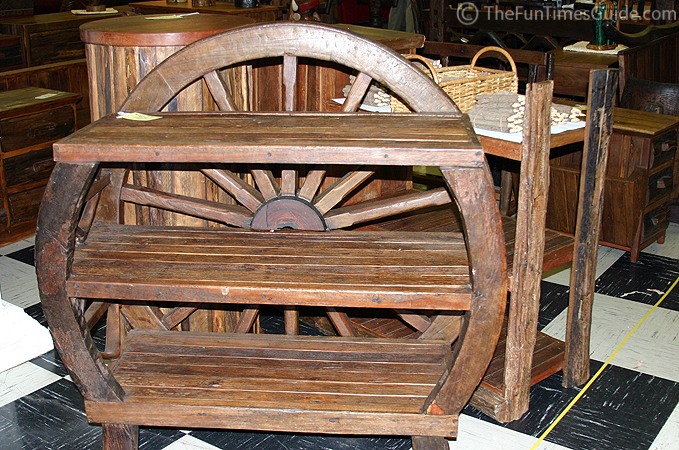 All of the pieces of furniture at Keepsake Imports are made from old wagon wheels and ox horns, as well as other everyday items commonly found in Thailand and beyond. I want you to know, none of the pictures — ours, or those on his website — do justice to the handcrafted perfection that you can see in person. Truthfully, we wanted to buy up just about everything he had on display at this show! Fortunately, Keepsake Imports will also be at the Log Home Show in Nashville in February, so we plan to fine-tune our shopping list with Joe at that time. 1. They are substantial pieces of furniture — not only are they incredibly heavy by their very nature, they are are also pieces that will last you a lifetime. The items he sells (and the products that they’re derived from) have already weathered years of exposure to the natural elements plus regular use & abuse in their “former” life, and it’s obvious that these pieces will last another few hundred years, no worse for the wear. 2. No two pieces are alike — they are truly hand-crafted, and it can take anywhere from 1 week to 1 month to finish one item. 3. No wobbly legs, squeaky hinges, or uneven ledges. One of the first things I noticed was that each and every piece I sat on, wriggled, or otherwise tried to move stood squarely on the floor. The feet were always perfectly flat on the surface. Plus, there aren’t any small moving parts or sections that could come loose on this furniture. Even the chunky blocks of wood that were carved to look like old-fashioned “locks” on the cabinetry held the doors shut very solidly. 4. They’re rustic (meaning dented, pitted, unevenly stained sometimes) and that’s what gives these pieces of furniture their character. They look all-natural and they are. Just ask him, and Joe can tell you precisely what “this angle brace at the bottom of a chair”, or “that table leg”, or “that shelf” was made from. 5. Definite conversation pieces! We’ve already got our heart set on the piece that will go right by the front door entrance… and another that will be the centerpiece for our bar area in the basement… and yet another for the entertainment center of sorts in the living room. Plus, they’ll even custom-build to your specifications!